Since the introduction of Android it has being gaining ground, even with the big Tech like Apple in competition, Android users have always have it pretty good. Android users get to choose from a bevy of phones far more diverse than Apple’s offering, and enjoy a level of freedom that Apple users can’t even imagine. But a crucial missing feature has been something like Apple’s iMessage, which turns mere texting into something much more functional, letting you seamlessly send messages from a laptop or any other Apple device. But according to leaked screenshots from XDA Developers, that beloved feature of iMessages might be in vogue to Android very soon. The team obtained screenshots from Google’s Android Messages app showing a desktop client, and while Google has not yet confirmed the news these screenshots all but confirm that desktop integration is coming to the app. According to these screenshots, the way the desktop integration will be done,is by downloading the Android Messages app, then visit the webpage messages.android.com. 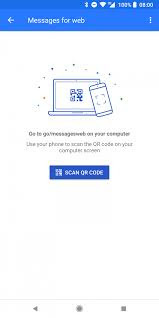 Once the feature goes live, you will be able to see a button in the menu titled “messages for web.” Alternatively, you may see a snack bar at the bottom that informs you of the new Messages for Web feature. Once you press on either option, it’ll take you to a new page asking you to go to scan a QR code on messages.android.com. Previously, this page didn’t exist, but now it is an actual subdomain that resolves to a 404. Given that the Android side of the implementation appears complete, we suspect that Google just has to flip the switch on the server side for this feature to go live. This will link the app on your phone to the web app and you’ll be able to send texts from any web browser. The features will be supports all major desktop browsers such as Chrome, Firefox, Opera, Safari, and Edge, and the service seems to remember the last computer you signed in.